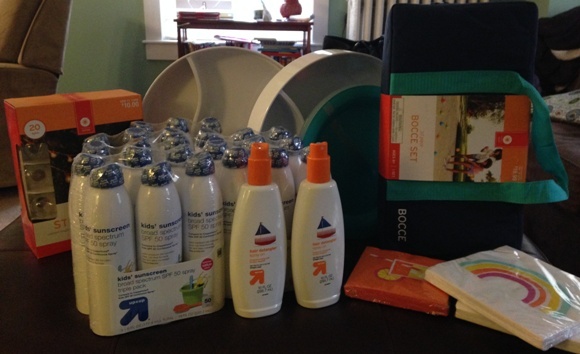 Today we are sharing readers Target summer clearance 90% off finds! We are totally amazed at all the super deals you all were able to score! Thanks so much for sharing with us. Erika hit the jack pot with her 90% off haul. 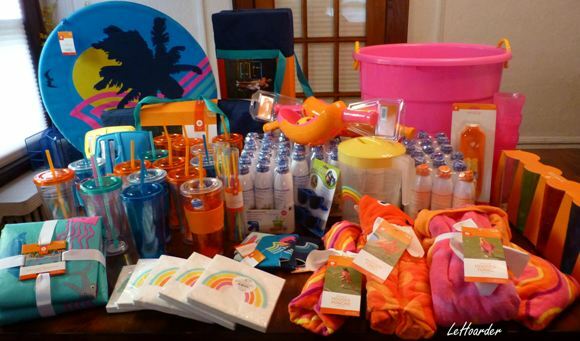 She paid only $58 for everything which included a few pools. WOW! Tumblers $.17 to $.19 each! All sorts of other goodies! 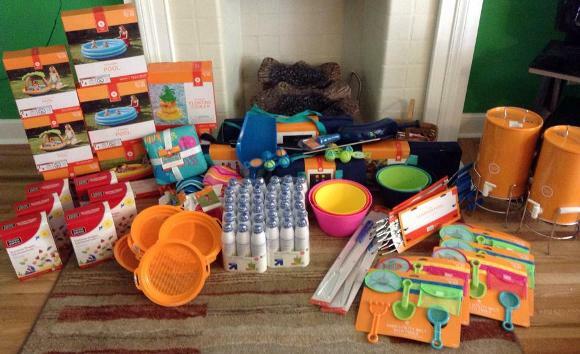 Check out all of the awesome 90% off goodies Michelle at Le Hoarder found. Tumblers, platter, buckets and so much more. Donna scored big time with her 90% off finds. I love the table tennis paddles, plus, the shark place mat is too cute. 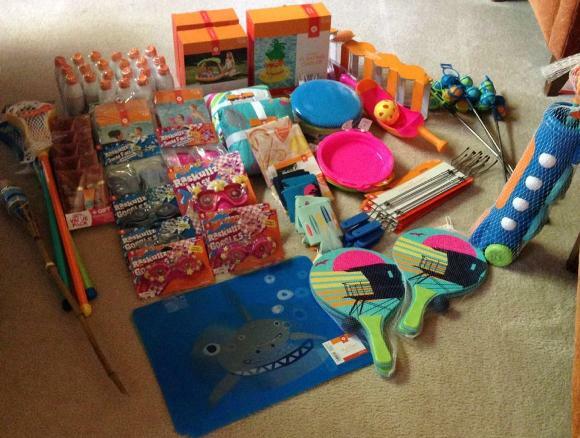 Here is Pam’s HUGE 90% off haul, toys, beach towels, napkins and the list goes on and on! 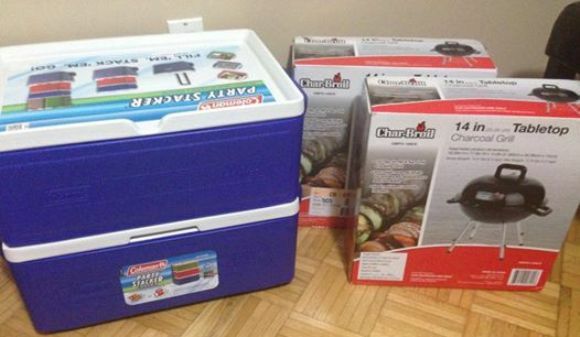 Pam’s favorite 90% off find was these coolers and BBQ grills which rang up at only $1.80 each! WOW! 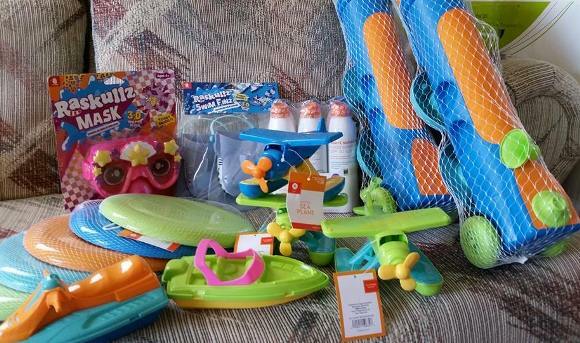 Jill did great and brought home lots of summer toys at 90% off. Best part, she only paid $9.00. 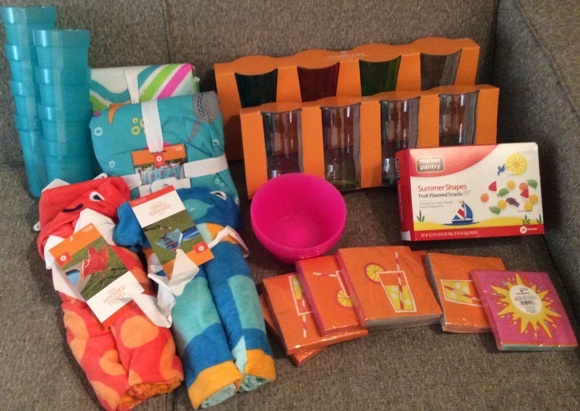 Cathy found beach towels, napkins, tumblers all at 90% off. Jennifer picked up all of this for only $16. Glad containers, sunscreen, plates, beach towels etc. 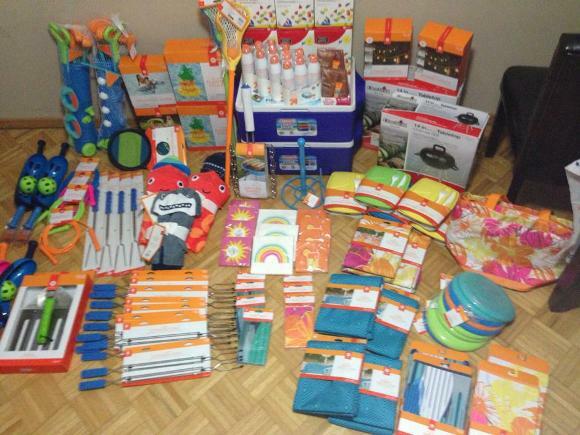 Natalia was thrilled with her 90% off summer clearance items, which included super cute watering cans, bowls, toy golf set & more. Look at all the awesome things Sarah grabbed at 90% off. 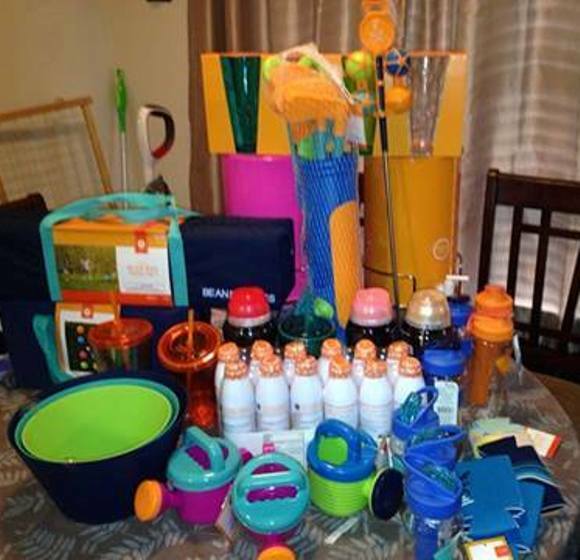 Maggie walked away with this awesome haul for only $75 which included 5 coolers, even though there were no clearance signs at her store! SCORE! 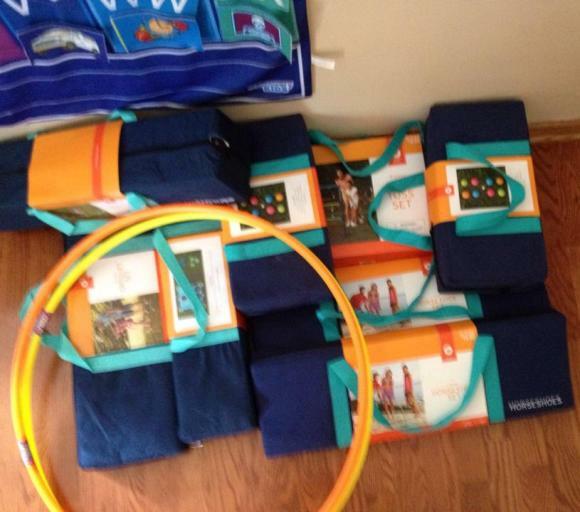 Maggie was on a roll and found tons of outdoor games and hula hoops marked down to 90% off. 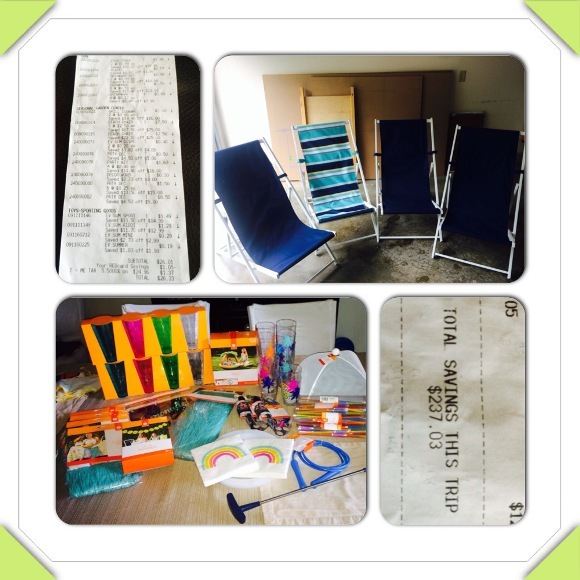 Gretchen’s 90% off finds included sand toys, folding chair, horse shoe game, golf set toys. 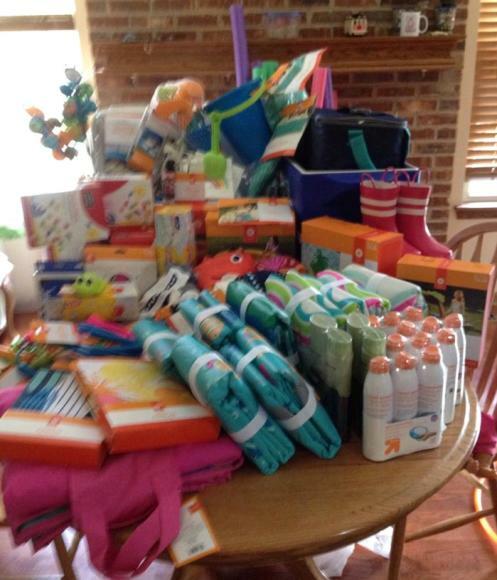 Here is everything Melissa got for only $13.48! I’m am amazed at all the cool stuff everyone found…I hope our stores go 90 today. When I went yesterday there wasn’t much left but there were no signs and everything was ringing 70 including beach towels. Also, what does everyone do with all that sunscreen? I know my family would not be able to finish all of that within a year….especially since thy have an expiration! Same here. I did get a cool drink thing 70% off but it wasn’t marked. My mom went back the next day and they were all gone. How much are the coolers ringing up as? Also what kind are they and where were they found? Not sure if the target near me has them. I usually like looking at the pics of people’s finds, but these were ridiculous. Who needs 36 bottles of sunscreen. It is obvious that some of these people wiped their stores out and didn’t leave anything for anyone else. That is really stingy. I agree, hopefully they donate. I was thinking the same thing, I hope they have a big family that uses a LOT of sun screen or she donates, otherwise no sane person could possible use all that sun screen. I have noticed that on a lot of the Facebook sales groups by me people sell things that they stock up on for a profit. Like I will see something listed as a ‘money maker’ or with a final price of .37 cents or something on this site and a couple of weeks later I will see people selling those items on Facebook sales for $1.50 or more. I was also pretty disappointed in the sales at my local Target. Everything was pretty much cleared out at the 50% off level on summer stuff, and after just a few days at 50% off they moved most stuff out to put in the back to school displays. Wow. Great finds. Thanks for sharing the photos. 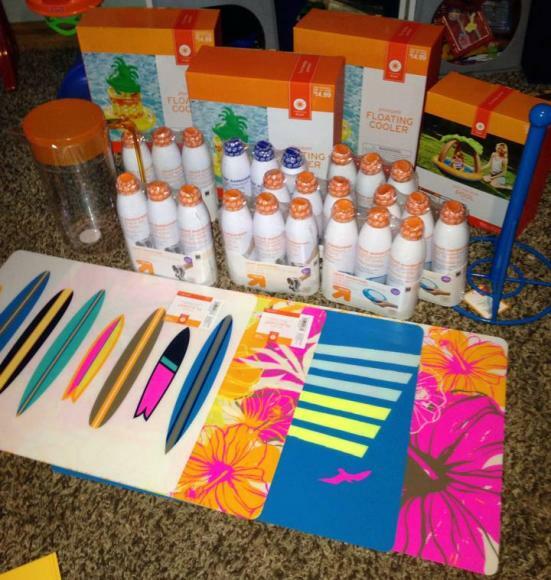 36 bottles of sunscreen that is on sale buy 3 get one free and will last until 2015-this Florida mom will take that deal all day long. We use an entire bottle in one day at the beach or theme parks. I picked up some at 70% but would have bought all they had if given the chance at 90%. Shopping at 90% is fun! I think you are all being really judgmental without knowing the facts about what people are doing with their suntan lotion!! I have 5 children. Three of them have red hair with blue eyes, two of them are blonde with blue eyes—in other words, we are all incredibly fair-skinned!! My oldest is a life guard (one of the redheads). All three of my boys play on baseball and/or lacrosse teams for school. Two years ago I walked into Sam’s Club on the first day of April, and bought 48 bottles of Coppertone (spray and lotion), for close to $400 dollars. I start putting lotion on my kids as they go to school in early April. My oldest daughter (blonde) rows Crew for her high school…they don’t let the girls go on the water after May 1st without lotion on, and she rows all summer. Needless to say, I went through all 48 bottles by the end of the summer (including a week-long vacation at the beach). This was before I found out about the lotion being 90% off at Target. Last year, I bought 60 bottles at 90% off at Target –and I had coupons which made them almost free, for a grand total of $12.00 (expiration dates of mid-2015). I should make it through this summer (and yes, I gave away 5 bottles to my very grateful friend who also has redheads). This year, within the last two days, I bought 84 bottles (no coupons)–for a grand total of $82.45. Some of the expiration dates are MAY 2017!! Why would I not buy these, which expire within 3 years? I got to one store early, and I took the 16 bottles I found. Today I went to another store which went 90% yesterday, and there were 70-something bottles still on the endcaps. Should I leave them there to go INF?? I will absolutely use these by the time they expire, and I am sure that I will give a few packs to my friend, but how is it more selfish (or as one person said, not sane??) of me to buy lots of lotion which I will use at a fraction of what it costs, but those of you who go to Target and stockpile napkins and cups are just fine? Thanks, Brandy, for chiming in for those of us who bought lots of sunscreen. Next time, maybe you others should think that there is more to what you are seeing than what you see!! I agree with you completely, Leslie! I stock-up big time on things for many different reasons. Usually I just love knowing I will have one less thing I will have to pay a fortune for (regular price) for a very long time. Also, 95% of the time expiration dates mean absolutely nothing- it’s a marketing ploy to make us think we have to throw out what we have and buy the products again. EVERYTHING adds up and if for the next three years you don’t have to buy any sunscreen and some other things you have found great deals on it saves so much money! Many people are judgmental and think they know what everyone else needs but they are the ones paying regular prices so the stores can afford to clearance things 90% off for us smart people! Uh, Leslie…to save some for other people! S.M.—You must be kidding?? On the SECOND day of a 90% clearance, if I see items there that I want and I can use, you can be darn sure I am taking them!! If you read my post, you would see that I bought 16 bottles on the first day (Tuesday) from the first store. This was all that I could find back by the summer section–I don’t know if there were others there b/c I was in a rush, but again, why should/would I leave some for others when I WILL USE THEM?? Why should I not save money so these “other people” you refer to who don’t/might not get to the store for the sale can POSSIBLY get them before they go INF? That is simply ridiculous. That is nonsensical. As for the second group of sunscreens I bought on Wednesday, I was kicking myself all Tuesday night for not looking for more sunscreen at the first store, and so on my way home from work on Wednesday at 1 pm on day 2 of 90% clearance, I drove past another Target that I know went 90% on Tuesday. This is on a major street in Philadelphia. At this point, any sunscreen I would find had been sitting there for one full day of 90% clearance (15 hours on day 1), and then another 5 hours of the store being open yesterday before I arrived. By my count, these “other people” you talk about had 20 hours of clearance shopping hours to get whatever sunscreen they may need from this store. Do you really think that I should leave any fantastic deal on day 2 of a 90% clearance sale so that “other people’ can get some? That is absurd. Why should I not save money so that other people who didn’t/don’t get to the store by day 2 of the 90% sale can POSSIBLY get them before they go INF within hours? So, when I saw that after a day and a half there were piles of sunscreen still sitting there…I got as many as I could fit into my basket. That is smart shopping…and I have no problem with it. If anyone had asked me for some, I would have gladly given some up. I am all about sharing…but I am not about to lose out on a fantastic deal because I am worrying about unknown “other people”, and not when we are on day 2 of a great sale…you get what you need to get!! Sounds like you are just being a sore sport. If you want the sunscreen, or any other great deal, get up early like I do, and go get it. If you can’t get up early, for whatever reason, then so be it. That is part of life. I couldn’t go out early for years…too many little kids, etc, etc..and I am sure I missed lots of bargains, but I just accepted it. I read what other people got, and I wished I could have gotten the deals, but I didn’t get angry and bash other people for getting a good deal–I was happy (but jealous!) for them. I stockpiled the sunscreen and ended up getting 16 packages of it. I’m sure having 48 bottles of sunscreen seems insane to some people, but not when you basically have to bathe in the stuff year round because you get sunburn just from being outside for five minutes. I could have gotten more of it when I was in there this morning, but I left over 30 packages on the shelves so other people could get some. I am working at the peak of my “business” year, so I only had time to stop by one target on Tuesday evening. Pickings were slim and I didn’t have time to cruise the aisles. What I noticed was, that instead of posted big red % off signs, they just had the little red peg markers. Is the summer clearance in 2 phases? Most of the Target store in southern california still had the summer items at full price. I have been eyeing the picnic basket, water jug, table runner etc. I’ve noticed that too. All the nicer summer items such as picnic blankets are still ringing up regular price $19.99. Hope those go on clearance soon 🙂 happy shopping.